The UK Royal Mint has shuttered its long-running plans to create a digital gold crypto token. Reuters reports that the Royal Mint had frozen its plans to issue Royal Mint Gold (RMG) tokens after its partnership with the CME Group fell through and the the UK government vetoed a plan to have tokens trade on a cryptocurrency exchange. "Over the last few years, The Royal Mint has been working on the development of a digital gold product, RMG, which was due to launch this spring. Sadly, due to market conditions this did not prove possible at this time, but we will revisit this if and when market conditions are right." RMG was originally scheduled to launch in the fall of 2017. However, when a partnership with CME failed at the last minute, the Royal Mint lost its trading platform to issue tokens on. The organisation didn't give up though and began looking for a crypto exchange to partner with instead but the British finance ministry reportedly blocked the move. The RMG token was then rescheduled to be launched in the spring of 2018 but once again things did not work out as planned. RMG was envisioned as a way to manage small amounts of gold which would make it easier for investors to enter the market and increase liquidity. 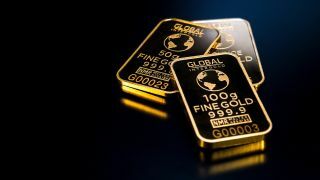 The Royal Mint also saw a great deal of potential value in the blockchain platform RMG was based on and the organisation believed it could be used to track and prove a piece of gold's record of ownership. The crypto security firm BitGo was chosen to build digital wallets to store RMG while Civic would provide know-your-customer (KYC) services for the project.